In recent years sea kayaking has grown in popularity, although many people are unaware of the long history that is associated with it. 4,000 years ago people in the Arctic were using the qajaq for hunting and fishing. Their boats were extremely buoyant, made of seal skin and easy to self-right, even if turned completely over. Rolling the qajaq was an essential self-rescue skill that was learned and was used in case of a capsize. Various rolls were developed to handle any and all situations that might arise, from being entangled in fishing lines, to losing a paddle and needing to roll using hunting equipment; or using only hands or elbows to right oneself. As the world changed, the qajaq wasn’t being used as much for survival, and there developed a concern that the history and culture associated with the sport could be lost. This is why, in 1984, the Greenlanders started kayaking clubs in several regions in Greenland. Competitions are held yearly and include races, harpoon throwing, rolling and rope gymnastics. The purpose of these competitions is to keep tradition alive, and to teach the skills that the Greenlanders relied on for so many years. The Greenland National Kayaking Championship takes place over the course of a week, and all ages, from children to the elderly, compete. In 2007 Greenland or Bust was started as a fundraising effort to get Helen Wilson to Greenland. Helen now travels to Greenland every other year, to participate in the Greenland National Kayaking Championship and/or to guide commercial expeditions. Greenland or Bust is now an instructional center based in Northern California. 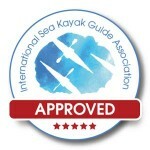 Our mission is to promote and instruct sea kayaking through both traditional and contemporary techniques. We deliver presentations, instruction, rolling demonstrations and overseas expeditions, along with BCU, ACA and ISKGA training programs. Greenland or Bust is also the organizer of the Storm Gathering USA symposiums.